The following post is the third in our series of entries submitted for the 1st Annual Lions Talk Science Blog Award. This piece is by Sang-Min Lee, a 5th year PhD candidate in Pharmacology. The concept of receptor-drug interaction has been the main mechanism for how drugs develop their clinical benefits. Drugs generally have target molecules and regulate their activity to make significant changes originated in cells. My research field is the dopamine D1 receptor, and it has been a promising drug target because its activation has shown to improve the symptoms of at least two neurodisorders: motor symptoms of Parkinson’s disease and verbal working memory in schizotypal personality patients. Nonetheless, more desirable D1 receptor activators are still required to maximize clinical efficacy and applications because the current D1 activators have several side effects and pharmacokinetic issues. There are two accepted D1 receptor signaling pathways: adenylate cyclase and phospholipase C activation. Experimentally, I could detect remarkable adenylate cyclase activation with dopamine and other D1 activators. When I tried to measure PLC activation, however, I could not detect the significant PLC activation shown in the previous reports. The first thing scientists do in this situation is to check if the positive control is working in the system employed. As expected, a positive control carbachol produced the dose-response curve of PLC activation. 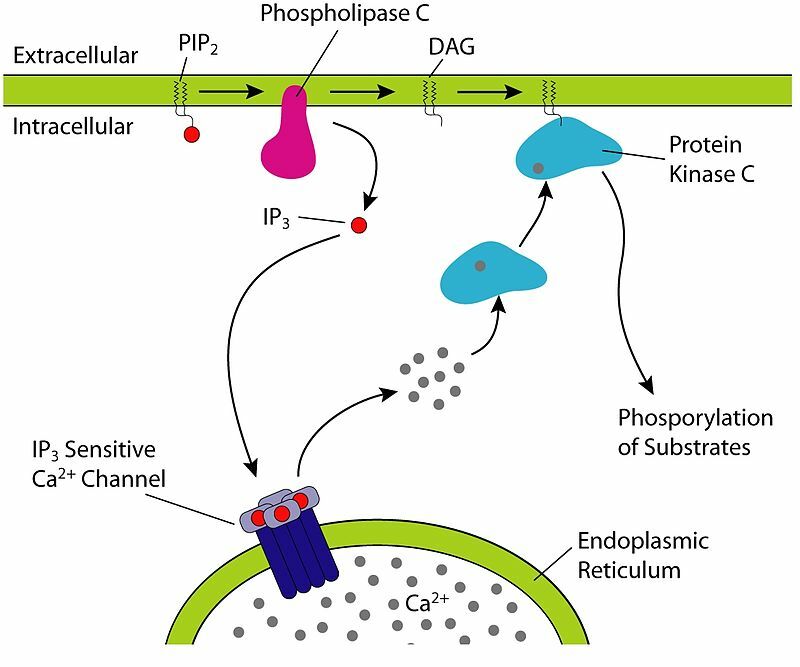 Carbachol activated PLC through muscarinic receptors in the cellular system indicating that the system I used has no issue on triggering PLC signaling. More importantly, I have found a paper showing that the PLC activation by a selective D1 agonist was unchanged in the D1 receptor knock-out mice. However, this paper did not reject the D1 receptor and PLC connection, but rather proposed a new hypothesis that novel orphan receptors that have D1 properties will mediate PLC activation. The dopamine D5 receptor was reported to have D1-like properties, but the expression of the D5 receptor is limited to hippocampus that is irrelevant to the tissues where PLC activation was measured. Although total mouse genome is available, no orphan receptor with D1 receptor properties has been revealed yet. The study with D1 knock-out mice is critical evidence for rebutting D1­-mediated PLC activation, but it has not been very much appreciated because the paper concluded with the hypothetical existence of D1-like orphan receptors. In addition, a D1-D2 heterodimer hypothesis has been wildly used for explaining D1-mediated PLC activation. Although dozens of papers suggest a link of D1-D2 heterodimers to PLC activation, there is another set of papers showing that the D1 and D2 receptors are totally segregated in brain suggesting that the D1-D2 heterodimer hypothesis is still under debate and controversy. Personally, the D1-D2 receptor segregation is more convincing because the transgenic mice engineered with fluorescent proteins clearly show separate expression of D1 and D2 receptors in brain. Nonetheless, the D1-D2 heterodimer hypothesis should be further examined by multiple independent research groups until the field comes up with the consensus. When biotech companies develop novel drugs, the previously published reports can be used as a scientific basis for their decision. The plans based on the hypotheses under debate (e.g., PLC activation by the D1 receptor) can risk wasting the resources without producing any meaningful outcomes. My experimental results suggest that PLC activation is not triggered by the dopamine D1 receptor. I strongly recommend that researchers exploiting D1 receptor signaling for drug development reconsider PLC signaling before they use it.